Karen’s European stages summarized | Home. There comes a time in your life when what you’re seeing, experiencing and feeling are not all that comfortable at all. As a reflection of these past three months of staging at In de Wulf, Kiin Kiin, Relæ and Meyers Bageri, I have learned a lot. With only a month max at each location, there is a steep learning curve. In de Wulf may have been the hardest challenge physically. The day after we arrived, possibly hung-over (that would be Justin. I know how to say “no”), jet-lagged and unrested, we started a six day stretch of 14-16 hour workdays (more of the 16 and less of the 14). I had not been used to standing in one place for long periods of time. It is a much different feeling on the feet when you get to walk around often to alleviate pressure on the same points in your feet. Some days I would go home on the verge of crying, cursing my Bragard shoes – yes it was that painful. As you start to feel sorry for me, my feet did get used to the stress after the third week. 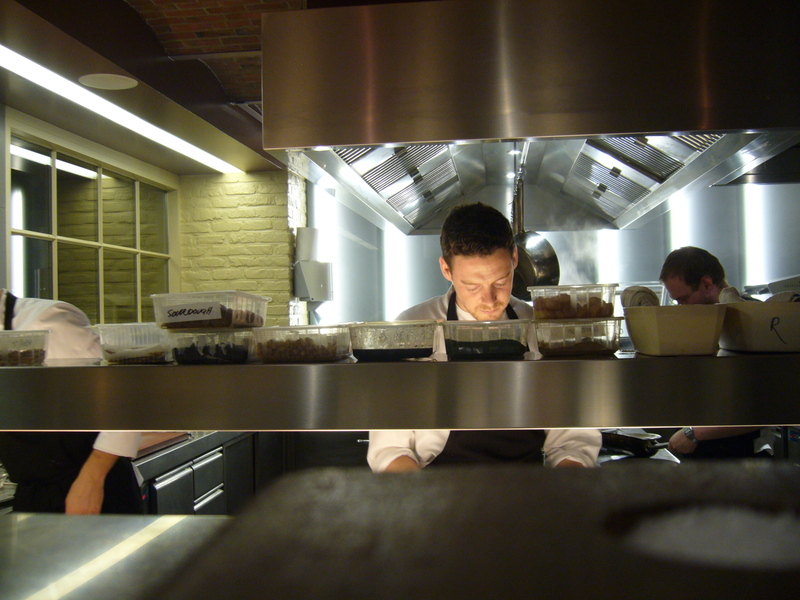 This was our first taste of a European kitchen. Some of it was different: European baking sheets, combi oven (ok, that was easy to adjust to), everything was in Celcius (good thing I was taught by French pastry chefs), everyone eats together for staff meal (no “buts”), back-of-the-house runs and usually explains the food, drinking water were from glass bottles, a driver picks up most of the restaurants’ goods that are not hand-delivered by farmers, the seasoning preference. What was so special about In de Wulf? The very obvious connection Chef Kobe Desramaults had with the farmers. Some of them are featured in his book. Milk came in glass bottles and tasted fresher than anything I had ever had before. Seafood was caught that morning. “Steak” knives were hand-made. We foraged a few times a week for herbs – sometimes in snow. Chef would be right there picking herbs next to you. On occasion, if we were ahead of schedule, we got a “break.” Chef would clean the floors and break down the station along with the rest of us. Chef Kobe definitely made it known how thankful he was to have us every night. We were treated as their guests and the only thing we could offer them in return was a Thanksgiving meal (and no they do not like sweet potato and marshmallow casserole). Oh, and Chef Kobe is kind of a big deal. One of the three Flemish Foodies. We could not have timed our stage at In de Wulf any better. Not only did the freeze come in on our last week, meaning we had herbs to pick all the prior weeks, but we saw much of the Flemish part of Belgium through the different events we helped out with (on our days “off”). 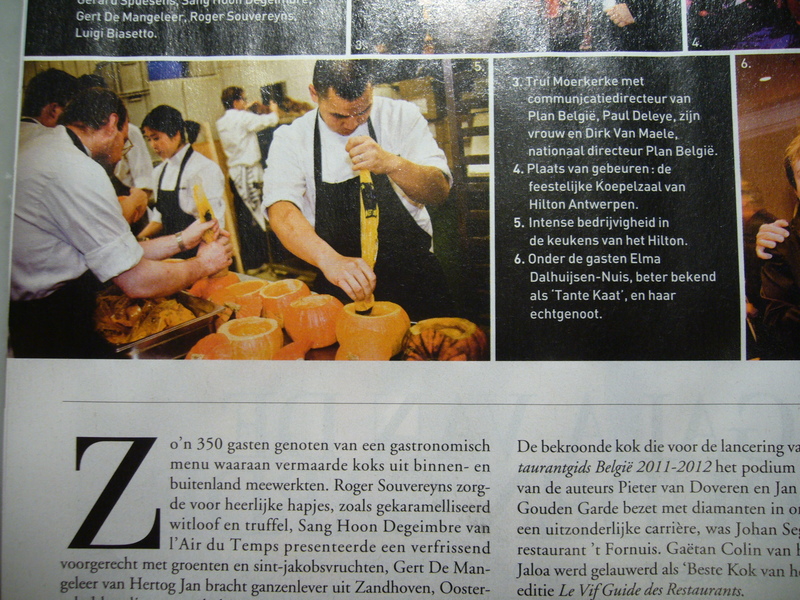 The first event was the Gala van de Gouden Garde. We had to serve 500+ who were helping raise money for a nursery school in Cuzco, Peru (translated by Google). Here we had the chance of meeting the other two Flemish foodies and Dominique Persoone, who is the best chocolatier in Belgium, and made it into a Belgium magazine. The second event was the release of Chef Kobe’s book at a local farm. The last event was viewing a one hour special on In de Wulf’s kitchen in Flemish at a local pub in Poperinge (which I believe we have been to on three separate occasions). One thing I learned is beer is cheap in Belgium and all of it’s good for drinking. I could use another few rounds of trappist beers and some dried sausages. Before we start each work day, we all sit down and have coffee or tea for about half and hour – even if we think we’ll be in the shits. Ok, I can get used to this. Now the day begins. This kitchen is starting to remind me of my Chicago restaurant experiences like at Blackbird and Tru (or Coi in SF) – lots of stair climbing. The staff here has been informed that I didn’t really want to do pastry here. Somehow, I think the email exchanges got lost in translation. My exact wording in the email was, “Although my background is in pastry, I am also very interested in the savory side of Thai cuisine.” This got me a lot more savory experience than I think I was ready for. My first day I was taught how to break down squab, filet a fish and how not to puke at the sight of blood. Fine. Throw it at me. With some determination, poise and a few demos later, I am ready for my next task. There is the small understanding that if a savory chef is to borrow a knife, it is never from pastry. It’s because pastry usually has dull knifes. Lucky for me we bought replacement knives (the knives are still in Belgium). In this case, it is not the knife, but the user that isn’t very versed in the art of fine slicing. As I slice the lemongrass for the salad, I have this chopping motion that I am told is not correct. (Justin tells me it’s the Chinese chopping motion and that’s why their knives go dull faster.) I am to leave the tip of the knife on the board as I rock the knife back and forth. It took me 5 times longer to slice the lemongrass, and I wasn’t sure it was good enough – I pick out the thicker slices. On the bright side, since I’m working savory, I can practice this every day. And squab. And fish. I never really feel comfortable on the savory side but I have definitely learned what I came here for – how to build up flavors with ingredients typical to Thai cuisine. I made quite a few friends here who definitely made me feel at home in Denmark. Relæ was not originally part of the staging itinerary, but with some extra stage help at Kiin Kiin, I was able to go over to Relæ on the weekends. Sous at Noma opens a restaurant with the intent of focusing on the details that do matter and letting go of the others – This is exactly what I want in a restaurant. It felt so natural to me. The point about it taking weeks to get used to a kitchen before I feel comfortable didn’t really exist here. After one service, when I knew where most things called home, I felt like I had been here for months. The cleanliness, the professionalism, the quality of the food, the energy, the organization – it was how I imagined. (I am not over-stretching this statement at all.) Everywhere I looked, I just thought to myself – that’s genius! So when I say (previous post) that you have to really experience In de Wulf to understand and fully appreciate it, the same goes for Relæ. 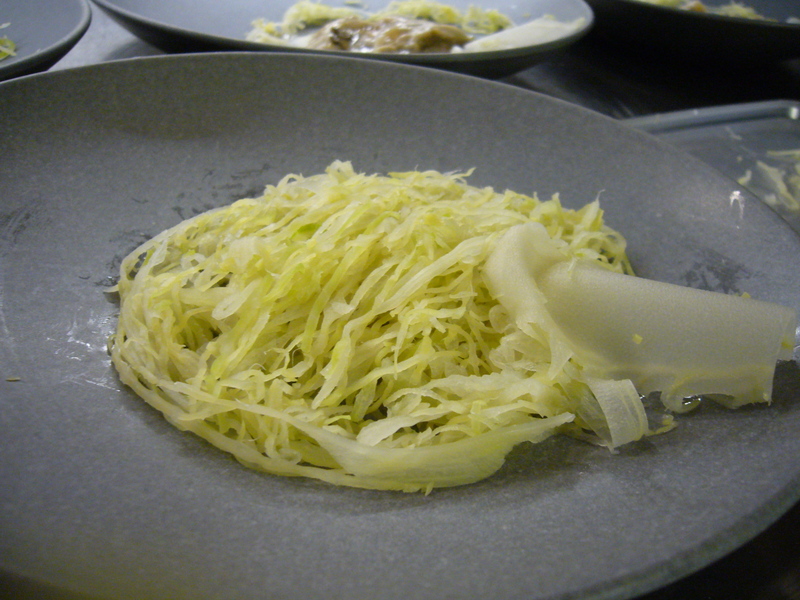 We don’t peel vegetables like carrots, parsnips or sunchokes. We scrub them. Why? To retain the shape and nutrients that lie in the skin, and probably some other reasons. We always have a clock/timer in front of us. Why? To do it faster next time, or to give a better estimate of how long the project takes for future reference. In making the best pot of coffee we can possibly make requires the exact amount of water and ground coffee, brewed at the right amount of time. The crew at Coffee Collective helps pair the coffee with the dessert. The thought is that even though the coffee isn’t served with the dessert, it should still be balanced. You’ve all heard by now that there is a drawer for the utensils, menu and napkin. This eliminates one employee, and allows for money to be spent elsewhere. “Jesus juice” is the water of choice for things like stock and bread so the flavor is never altered by the minerals and taste of tap water. Portioning isn’t just for giving everyone the same amount. There is the right amount of acid, crunch (and carrots) to a plate. If you can’t make it out to Relæ, at least give Jægersborggade a visit. Jægersborggade is the new “in” street in town. There’s an organic bakery by the name of Meyers Bageri, an organic hair salon where I got a free haircut, Coffee Collective (well-known worldwide as one of the leaders in coffee), a ceramic maker who makes pieces for Relæ and a group of young men who are selling cannabis and eluding cops. I have witnessed arrests; I have heard of seeing bloody hands on windows asking for help; I have heard how they manage to set up post every day without being caught 99% of the time. Make time to visit all the spots along the street. Just don’t get caught. I came here with the intention of seeing how to make wienerbrød, Danish-style and to touch dough (as a Baker it doesn’t feel right when you haven’t been baking for a while), but have learned much more than I imagined. Bread is something that every head baker approaches differently. Bread has to be processed differently when flours, water, sourdoughs, temperatures are all different. The way they bake bread here is less restricted and more of a feeling. 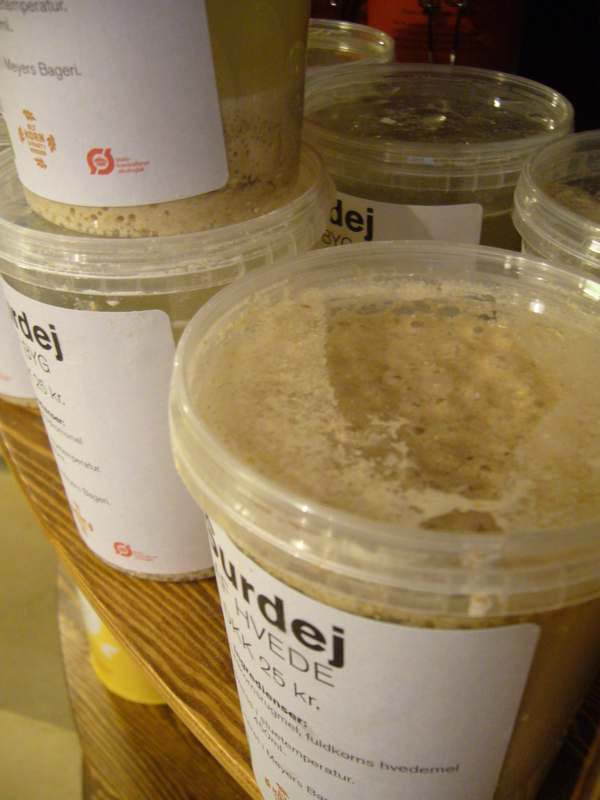 The flours here are all organic, mostly from the Denmark region of Mørdrupgaard. Some of the flours are ground on-site. The sound might be loud to the inhabitants above, but they did agree to allowing a bakery to open just below their flat. The different doughs here really express the flour and region they come from – each having their own distinct flavor. The bygbrød (barley) and kamutbrød are baked in the same way as the traditional Danish rugbrød, in the efforts to bring more attention to the flours. There is only one shift for bread – 5am to 1pm. All the mixing and bread baking goes on during this time. We even laminate daily because we don’t have the luxury of a freezer. In general, the lean doughs are mixed, placed in the walk-in overnight and baked the next morning. This allows the doughs to ferment at a low temperature for a longer period of time, which equals flavor. I have found that the Danes prefer a very loose sourdough, like thickened water. I have been used to a almost equal parts flour and water. A looser sourdough (3-4 times as much water) is “less sour” and creates a more elastic dough (less strong) assuming all else is equal. Doughs here are mixed slightly longer on second speed than I am used to, but I remember reading somewhere that the grains in the US are higher in gluten than the European counterparts. I’m still trying to digest everything I have seen (and eaten). a student, a sister, daughter, best friend, baker, thrower of dinner parties with friends, taker on challenges, jumper at the opportunity to fail, an awe-experiencer, and lover of sunflowers. The awesome thing about this post is that I can feel the richness of your experience from your words. For me, the value of a job, the “what you get back”, isn’t just the money, but it’s how it shapes you as a person and let’s you grow. I think while you’re obviously lacking in the former, you’re also obviously (thinking of the opposite of “lacking”) not lacking on the latter. In the end, enriching experiences like this color your life way more than money can. It provides a richness and depth that money really can’t buy, it can only facilitate. I read this, and I am reminded of how unhappy you were in the corporate world. You gave gave gave, and just didn’t get that reciprocity that you expected. I am hoping that now that you are giving, giving, giving your all in another arena, that you’re starting to get something back. See you in Houston soon, my friend. Will and I are eagerly anticipating y’alls return ;).